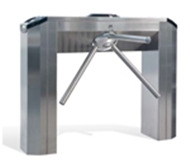 Twister light is Came’s new turnstile for transit selection in areas with high-flow volumes. Made of stainless steel it is ideal for train stations and ports, underground stations, sports centres and any setting that requires selection of people-transit flows to optimise entry and exit operations. Twister light also seamlessly integrates with Came’s access control systems.